Both have had varied careers that provide unique perspectives for their roles - Dr Myrtle was an organic chemist researcher and climate change policy advisor, while Mr Billimoria worked in energy and infrastructure investment in the US and Australia. The pair now both work at AEMO as Senior Analysts in the Market Insights team, which involves analysing AEMO’s electricity and gas markets to produce reports and insights that help the sector understand what is happening in our markets, including drivers. Producing the Quarterly Energy Dynamics reports are a large part of their roles, both having worked on them since their inception. How long has AEMO published the Quarterly Energy Dynamics reports? We have produced the Quarterly Energy Dynamics reports internally for over two years, but our first publicly available report was published in early 2018. So far, these reports have been well received by our stakeholders and we’re continually looking at fresh new ways to present our data and findings. How is the information collected and analysed? Our reports are based on publicly available information, much of which is accessible from our NEMWeb website. Given the breadth and depth of information available, careful analysis is required to be able extract the key market outcomes in relation to pricing, demand, generation, dispatch and flows. Our energy market is in a state of flux and new trends can appear quickly. It is important for us to be constantly aware of current and emerging market dynamics. 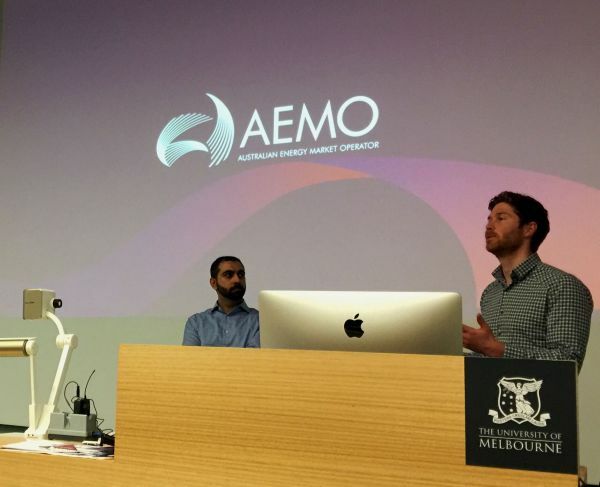 How does the analysis assist AEMO and the energy sector in future network or business planning? Energy is a hot topic in the media, and there are many (often conflicting) messages out there. Our reports aim to extract key trends based on observable data and provide the market with an independent and unbiased analysis of the energy market. An objective source of information is critical for decision making, planning and policy across industry participants, investors and government. Are you able to give a brief preview into the latest report findings? Sustained high prices in the wholesale electricity and gas markets. A steady fall in output from gas-powered generation over 2018. Over 3 GW of large-scale variable renewable energy commencing generation in the NEM during 2018, representing a 66% increase on levels at the start of the year. We will publish the report in early February. Farhad Billimoria and Dr Jonathan Myrtle will be presented the results of the 2018 Q4 Quarterly Energy Dynamics report at the University of Melbourne on 21 February.